John Zurier’s oil on linen paintings at Gallery Paule Anglim transcribe how painterly presence evokes emotional response. Zurier, a painter working in the Bay Area for over twenty years, fills the gallery with a soft palette of complex relationships of color. These are not merely beautiful objects whose mystery is fleeting. They do not give out their charms immediately. The essence of these paintings will be revealed upon closer speculation over time. All of the decisions made during Zurier’s process are essential. The artist hand picks his stretchers and selects their combinations of scale, weight, depth, color and texture. These characteristics determine what is necessary to make a particular painting and to convey a specific experience. Zurier acknowledges the content of the surface. The tooth of the linen and its natural woven grid are as much components of the painting as are the slightly protruding lines of the wooden stretcher bars. The way that corners of linen are tucked in or under, tacked along the sides or pulled taut, alter the personality of the painting and add to its’ objecthood. 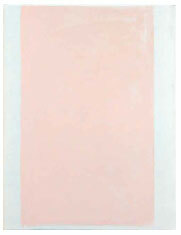 These paintings, comprised of subtle layers, are immensely tactile, yet incredibly flat. 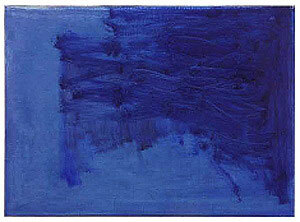 It is serenely noisy in the quiet world of Zurier’s paintings where manipulated lightness leads to elation. 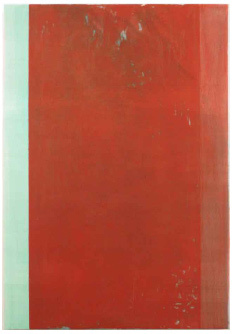 In the space of these paintings the viewer is confronted by tempered marks of green. A rusted sienna appears over azure. There are sectioned off shifts of red that could be orange and orange that could be red. 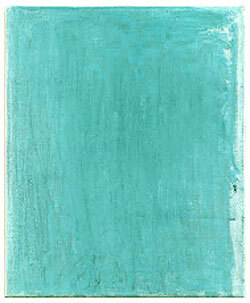 Tangles of minted green paint are constrained only by the structure of the canvas. Color is in pursuit of color. Stormy blue laced with purple overtakes a terra-tinted canvas. A hint of unexpected pink has escaped this bluster of tonal action. Predatory brush strokes hustle into settled areas of rubbed in paint. There isn’t any muddiness here. There are only layers and layers of freshness. Skimpy color is full of body. Even the sheerest hue has ample form. “Clarissa”, (Oil on linen, 33x25 in., 2005), is among the paintings whose titles come from the writings of Alexander Pope. On “Clarissa”, soft splotches of pale greens erupt as delicate blisters of brushed contact. Slabs of peach and white fight and relate, evoking the warmth and coolness of this harmonious contrast. Zurier honors all aspects of painting and the totality of process. These paintings acknowledge error and intuition with their methodically blended color that is charged with emotion. 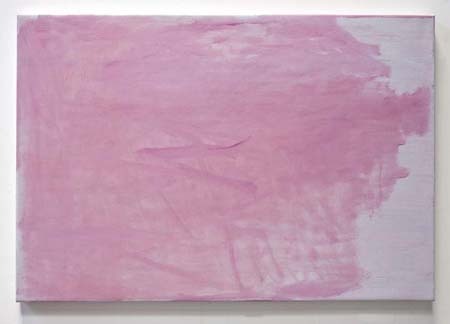 “Degrees of Swiftness”, (Oil on linen, 21x29 in., 2004), with its slight thickness of paint converging on one side, makes the viewer conscience of the physical movement of the brush. The paint contracts and spreads out but needn’t travel to all corners of the canvas. This painting could have been mulled over for months or may have been born in a perfect moment. “To Failings Mild”, (Oil on linen, 23x19 in., 2004), is a painting from 1998 that Zurier humbly kept and reincarnated. Through the means of re-stretching and turning it inside out, the artist created a new history laden object to work on. The giddy rejuvenation that one feels when looking at Zurier’s work comes from all aspects of his studio practice. It is remarkable that so much of the physical processes and decisions in painting can affect our mental states. Each work is a specific sensory experience that takes one to places where the stomach churns, the heart does flips, and where the eyes do not rest. John Zurier’s intensely constructed paintings encourage the same patience from the viewer to get closer, visit often, and stay longer. The encounter will be vastly lush. — Prajakti Jayavant is an artist and writer who lives and works in San Francisco.